Mobile storage service – idea by Rafał Kołomański, owner of Warsaw based „Więcej Miejsca” (=More Space) company. In special plastic containers and monitored warehouse, you can safely store your belongings. Moving in or out? Renovating your apartment or office? In need of more space? 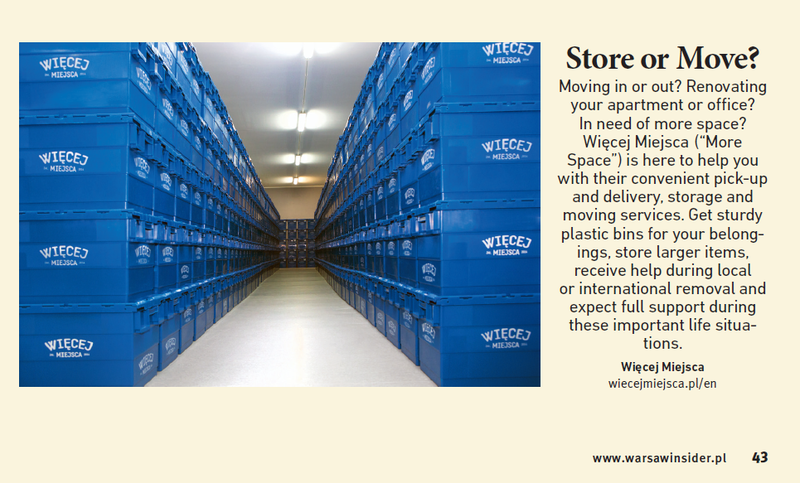 Więcej Miejsca (“More Space”) is here to help you with their convenient pick-up and delivery, storage and moving services. The business was the answer to his own problems. A growing number of things and still the same living area has forced Kołomański to look for the solution related to detention of belongings. His idea proved to be a very good way for own business. Leaving a corporation, he decided to offer the Varsovians Więcej Miejsca. On the website www.www.wiecejmiejsca.pl or by phone (733 002 014) we can order the solid storage bins, which Więcej Miejsca company will deliver to our home, free of charge. The company’s driver will collect and transport to the storage facility all our unneeded – for some time – clothes, shoes or books. When we want these things again, we just order their return. We’ll get them even the next day. Winter is a very heavy period for the cyclists – quickly falling dusk, low temperature, rain or snow falls do not encourage cycling. That is why many people prefer to put the bike on a side and replace it with the other form of physical activity: running, swimming pool or gym. Another problem is the place where you can store your bike to the next season. Some do not have much space due to a small apartment, the lack of access to the garage. In such a situation Więcej Miejsca comes with help. As every year, we can say only one thing: we are proud! It is good to look at such a large group of Polish projects, which have been implemented into production. It gives us a hope that other Polish (and not only) houses will fill up with the native projects. Więcej Miejsca – the service that allows you to hand things for storage. You have a small apartment and looking for a way to gain extra space? Discover the practical solutions that will allow you to save space in apartment. Więcej Miejsca is the service, which was created from the need known to each of us. Too much stuff, too little time. Now there is the solution. How much easier it will be when the storage bin comes to our door, leaves when it is packed and returns from the storage facility when we want it back. “You should not multiply more entities that is necessary” – claims the thesis, formulated centuries ago. After an era of tremendous consumerism, the minimalism is at the forefront. Also the one connected with the place of residence. must have awards 2015 are announced! Must have is a project consisting of a plebiscite and exhibition. In the framework of the plebiscite, the Council of experts, consisting of media and important design centres representatives, make a subjective indication of the most interesting and remarkable items reflecting current trends in design. There are almost 300 thousand students in Warsaw. Some of them live with their parents. Some are renting apartments or even have their own (credited) – but as a general rule, square footages are not large enough to store all seasonal clothes, books or things, such as for example: skis or snowboard in the summer or a bike in the winter… Now they can hand us some of their stuff for storage (for a small charge) and live more comfortably. “Więcej Miejsca” is the unique storage service, that will store all your stuff, protect it from damage and loss. In the special plastic boxes you will store unneeded clothes, books, documents and things which are already too small for your kid, and you want to keep them for the next child. Więcej Miejsca also offers the “virtual storage” service which allows you to preview the stored items. You have a small apartment or do not have a basement and you need to hide somewhere Christmas balls or books? Overseas, a solution to this problem was found a few decades ago. Więcej Miejsca is the innovative project that is implemented, in Warsaw for now. The service is mobile. To use this service, you need to order it by phone or via internet. You do not need to have your own car. The company delivers – free of charge – special bins made of hardened plastic to the customers and they can pack their stuff into these bins. Recently I learned about a brilliant service, thanks to which you can really gain extra space in a small apartment. Więcej Miejsca company delivers storage bins in which the customer packs his stuff (e.g. unneeded winter clothes). And you, do you need Więcej Miejsca (More Space)? Since a few weeks there is a new start-up on the market, which aims to provide more space to Poles , mainly those living in Warsaw for now, in their own homes or in firms. The stuff can be stored in special bins, in secured storage facility. When you no longer have space and no idea what to do with things, it does not mean that you have to buy a bigger apartment. Just rent a mobile wardrobe. Here is www.wiecejmiejsca.pl, exemplary connection of e-business with the real economy. Więcej Miejsca will deliver the space to your apartment. You can order the service without leaving your home. The company will provide (free of chargte) the storage bins for your stuff, take them to the storage facility and return when you need them. In the virtual storage you will have an online preview of what was handed for storage. It most often happens like this: the guests bring toys for your child, the grandparents at any occasion give them clothes, dolls, toy cars and for you it often is also difficult to resist from buying beautiful rompers or soft toys. The result? Children’s room after some time is bursting at the seams. Fortunately, you don’t have to throw away your excess stuff. You can cleverly store. A statistical Pole has less than 25 square meter apartment or house, while some European countries citizens even twice! In small rooms we are more and more often crowded with our own items. That is why a company was established in Warsaw, which – the first in Poland – delivers space in solid plastic bins. It also creates a virtual storage for the customers to remind them what they handed for storage. It was life itself that gave him the idea for the business. Living with his wife and two children Kołomański had less and less space for the items multiplying at home. – We watched friends and it turned out that we are not the only ones to face such problems – guest of radio Four said. A storage space or a basement in today’s construction industry have become a luxury, so we more and more often complain about the lack of storage space. What would you say for storage of temporarily unneeded stuff – just as music, photos or other digital files – far from home but with the possibility to get them back any time when needed? Wiecejmiejsca.pl offers such a remote storage. How to store winter clothes? If you really don’t have a free storage space, do not pack stuff tightly at your wardrobe! Use the possibility of renting time storage or the services of special companies offering time storage of the stuff, such as www.wiecejmiejsca.pl. Pack the stuff in individual bags or boxes, and when courier arrives, put everything into the delivered bins and you have the problem solved for a few months. “Więcej miejsca” is an alternative to renting warehouse space. The service will be to the benefit even for scatterbrains, because each bin must be described and the items in it can be photographed. It is easier to find needed clothes, objects or binders in the virtual storage. Just order the service and the storage will come to your home. “Więcej miejsca” is also a solution, that will help you to move, just order the bins, pack them and describe in the old apartment, and order the delivery to the new house. Although a good idea is one of the cornerstones of the business, still a lot of young entrepreneurs have a problem to choose the right industry for themselves… Life and personal problems gave the idea for the business also for Rafal Kołomański from Warsaw. He came up with the idea of a service, that is not only the storage of the stuff, but also includes collection and direct delivery to the customer. Then the Pole established the company Więcej Miejsca and the platform was just launched in Warsaw. The idea of self-service storages came to us from the USA. It works well, because the apartments are getting smaller and smaller, and the basement or resident’s chamber are not always included in the package, especially in a new construction, where the extra space is not provided for all. Rafał Kołomański, together with his brother Michał, have also decided to invest in space for rent. Their Więcej Miejsca company, which was officially launched in early April, is however not a self-service storage, but the storage… with the service. Do you know it? Wardrobe does not close itself and you can not push past the skis, bicycle and baby carriage in the garage. Beloved “hamsters” – there is a rescue for us. Listen to Rafał Kołomański. Instead of throwing away or packing tightly in the wardrobes or basements your old toys, winter clothes or furniture, you can stuff them into the rented bins. A company, which collects and stores the items, has been just established in Warsaw.